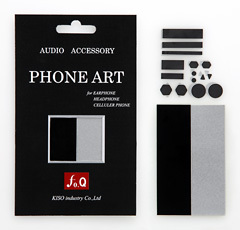 PHONE ART is a material specially designed to improve the sound quality of earphones, headphones and portable audio players to which our fo.Q products for sound quality adjustment has been applied. 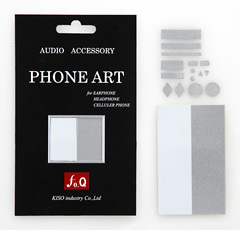 PHONE ART is provided in the form of seals with various cutout shapes, making them easy to affix, without worrying about fitting them to the shape or size of the particular device. PHONE ART effectively absorbs subtle vibrations generated in various parts of earphones, headphones and portable audio players, as well as suppressing acoustic noise produced by these tiny vibrations. The result is an overall improvement in sound quality. PHONE ART is extremely effective in improving the sound quality of earphones, headphones, portable audio player units, mobile telephones and other devices. Because PHONE ART is provided in seal form, it can be affixed to devices very easily. You can enjoy experimenting with it, using the figures provided below as references. If the earphone has a hole in the back of it, be careful not to cover the hole with the seal. If affixing the PHONE ART around earphones, be sure to place it in the same position on the left and right earphones, and to cover the same amount of surface area on both earphones, in order to preserve the acoustic balance. 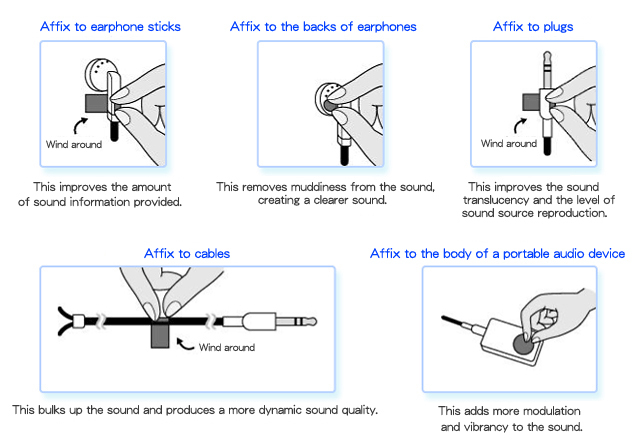 Do try affixing the PHONE ART to the speaker or near the microphone of a mobile telephone, and see how much it can improve the sound quality.